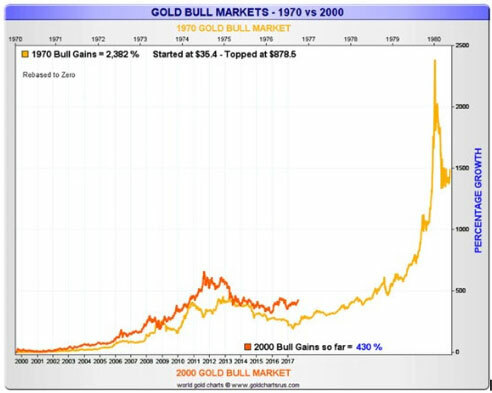 Should one invest in gold and silver now? Follow a ‘mind like water’. We’re in the midst of a massive, transformational change that will redefine where we are, what we think is true, and where we believe the future is headed. With sensory input from across the political and economic spectrum of the Internet bombarding us 24/7, it’s understandably difficult to follow through on a decision once made, even if you’ve researched carefully and thought things through beforehand. Nowhere is this more difficult right now than the decision of whether or not to invest in – or add to – one’s position in the physical gold and silver space. Not only that, but when you add all the noisy arguments from competing investments which seem to be doing much better while the precious metals slumber, it’s understandable why some long-term information-overloaded investors have decided to sell their metal. I’d like to suggest that those who hesitate to buy, or worse, decide to sell what they already have are going to experience considerable remorse – and soon. In this state, thinking is minimized, listening/watching emphasized. To get an idea of the clarity that can be achieved, look at the picture below. I took this photo during a rare moment when all the elements necessary to build such a scene were present. The water is dead calm; the sky is so full of more-or-less stationary cloud formations that it’s difficult to see where one begins and the other ends. At the same time, nothing is distorted. The glassy water “mirrors” the clouds exactly as they look in the sky. Being in the moment mostly involves paying attention. There’s a lot to be said for “planning your work”; then “working your plan.” At some point you’ve taken your position and set aside money to buy more metal, either at certain intervals or into declining prices. Then just let things be. Try not to be swayed by counter opinions, even if they seem to make sense. If this is difficult, don’t feel so bad about it. Even the investing greats have to remind themselves from time to time. After spending many years in Wall Street and after making and losing millions of dollars I want to tell you this: it never was my thinking that made the big money for me. It was always my sitting. Got that? My sitting tight! It is no trick at all to be right on the market. I’ve known many [traders] who were right at exactly the right time, and began buying or selling stocks when prices were at the very level that should show the greatest profit. And their experience invariably matched mine; that is, they made no real money out of it. Those who can both be right and sit tight are uncommon. I found it one of the hardest things to learn. But it is only after a stock operator has firmly grasped this that he can make the big money. 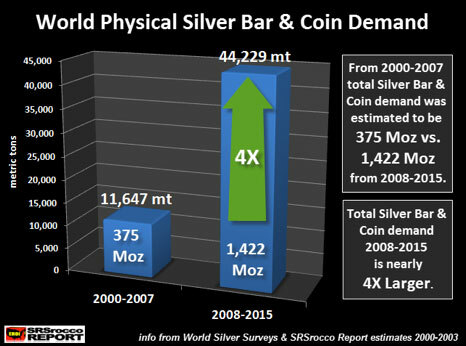 Steve St. Angelo’s excellent world physical silver demand chart shows a powerful 4x increase during the last decade. This “trend in motion” will continue. Realize that the blockchain and gold (+silver) will coexist. Yes, the current hyperbolic rise in bitcoin may be side-tracking some funds that otherwise would find a home with precious metals (though there has been no major outflow from metals’ ETFs). But in this writer’s view, an even bigger reason is that some long-term holders have developed a level of fatigue waiting for metals to rise while the stock market and bitcoin seem to be on a never-ending run. This, in spite of the fact that gold is actually up around 10% in 2017. (I will) state adamantly that blockchain will increase demand for gold. Indian investors will seek to put a portion of their huge blockchain profits into physical gold because they are essentially mandated to do so by their Hindu religion. Western investors will do the same when the stock market finally rolls over. If gold-backed blockchain currency goes mainstream, demand for gold would increase even more significantly, and do so in a sustained way. Step back from the “noise” (charts, talking financial heads and top-callers) that blurs your vision. Work your plan by continually adding – via dollar cost averaging, regular buying or “taking some money off the table” from other winnings and plowing it into precious metals. Let your mind (and emotions) rest on the picture above and you’ll achieve a level of clarity most others will not. Be right. Sit tight. David Smith is Senior Analyst for TheMorganReport.com and a regular contributor to MoneyMetals.com where this article first appeared. For the past 15 years he has investigated precious metals’ mines and exploration sites in Argentina, Chile, Peru, Mexico, Bolivia, China, Canada, and the U.S. He shares his resource sector observations with readers, the media, and North American investment conference attendees.